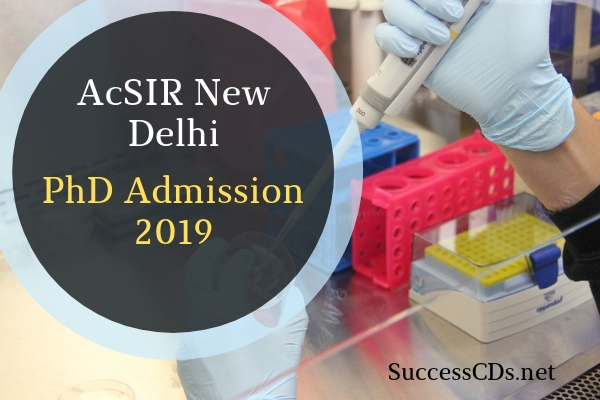 With about 3500 PhD students on its rolls in Science and Engineering, AcSIR is one of the largest institutions of doctoral studies in the world. Meeting all the conditions stipulated by AcSIR for industry-sponsored* students. *with endorsement from Industry, Academic or Research Institutes for required academic leave and financial support during program. Direct: Undergraduate degree in Science or allied subjects with at least 8.5 and/or 1st rank holder in University/ Institution*. Applications are accepted only through AcSIR Admission Portal https://acsir.res.in. The candidates can exercise a maximum of three preferences for labs. Please visit AcSIR website https://acsir.res.in for online application form submission and additional details. No TA/DA is admissible for interview. No separate call letter for Aptitude Test/Selection Interview will be dispatched; the shortlisted candidates are advised to plan their travel arrangements as per the schedule of admission notified on the website. For details, applicants are advised to visit the website https://acsir.res.in from time to time for important and related announcements.